Delicate, dressy and perfectly divine! This bouquet of pretty blooms in gentle shades of red, pink and peach is a study in pure elegance, and a wonderful gift for birthdays, special occasions or any day of the week. 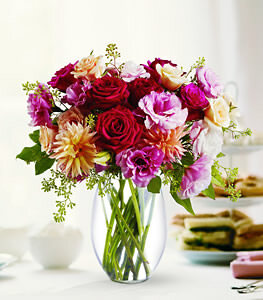 Roses, dahlias and lisianthus -- in complementary shades of red, pink and peach -- are delivered in a clear glass vase.